Topics: A&a Technology, Linux, and Lamp Install. 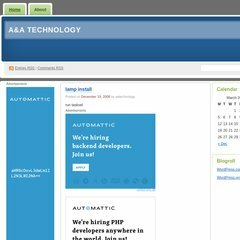 aatechnology.wordpress.. ESX Server 3.5 – A general system error occurred: The file is ..
Its local IP address is 74.200.243.251. It is hosted by Layered Technologies Inc (Texas, Plano,) using nginx web server.